BRING ME THE HORIZON have been on a rocket of a journey over the last few years, selling over 4 Million albums globally to date and 2019 is already proving to be an incredible year for BRING ME THE HORIZON following on from an equally as impressive 2018. Their highly anticipated sixth studio album, amo, debuted at #1 on the ARIA chart, their fourth #1 ARIA album debut. amo marks a huge step for BRING ME THE HORIZON and is easily one of their most exhilarating and genre-spanning albums to date. The three singles have amassed 100 million streams and earned a Grammy nomination for the first single taken from amo; MANTRA. 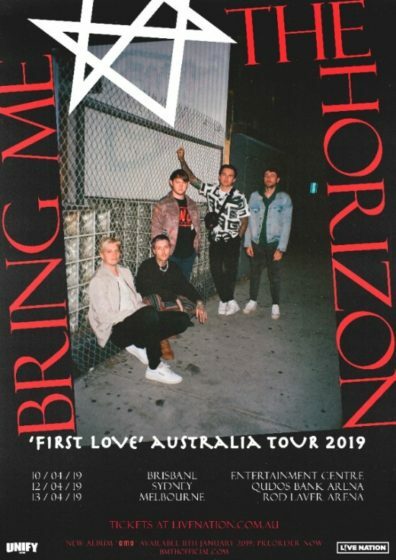 Tickets for the ‘First Love’ Australian Tour are on sale now.